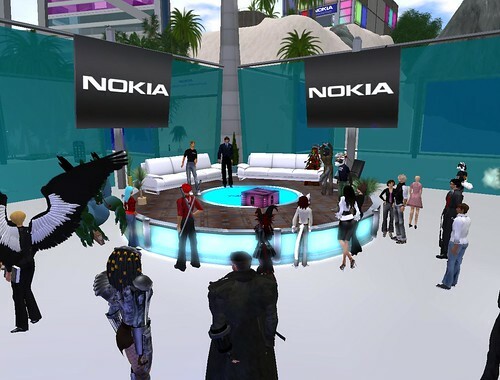 Last night I had the pleasure of speaking at a Nokia connecting worlds event in Second Life. The subject for the panel of us invited to talk was that of human and non human avatars. In particular we represented people with avatars in SL or multiple looks in SL that were not regular real world mirrors. It was a very interesting set of perspectives that we all brought to the event I think. The discussion of identity and the prejudice and also the power of using particular ways of interacting in virtual environments is a rich subject. It is also full of personal experience and though for each of us. Faced with an avatar based experience everyone who enters has to choose something, even if the choice is to do nothing, to represent them. However as they engage and act the avatar starts to not just be a visual but a repesentative of attitude and action. 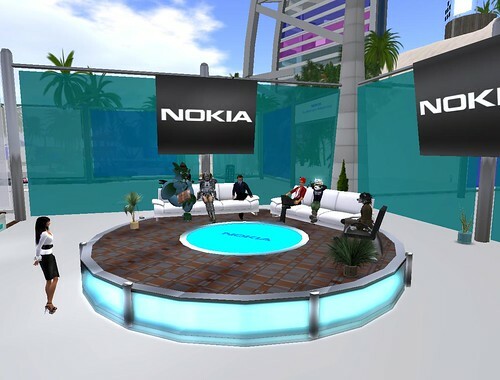 The panel was formed of Blue Linden, Myself, Digistar Brouwer of Nokia, Hiro Pendragon, Selkit Diller and Flea Bussy, moderated by Hydra Shaftoe. Also for me the conversation and answering the questions ranged from my experience at a large corporation having represented both myself and their interests as epredator, flowed into how I show the fact I am clearly a science fiction fan with my AV and also how I try and act with the same strength and honour blended with the ethos of another character. Clearly all that in conversation blends business and play in many complicated ways. The need for personal brand, for ego and for championing a business cause yet all being described to a group of people world wide when for me it was 8pm and I was at home having just put the predlets to bed. So clearly work and play (which can be the same thing if you enjoy the work) have already merged. Sharing personal experience that some people may use for commercial advantages, or for personal enhancement crosses the boundaries. As I often say all this is about people. Thats the bottom line. People connecting and getting done what they need to do, direct to one another with reduced overheads. As is also customary at any online gathering there is a post event mingle, this shows the great leveler that virtual worlds are as the social construct of audience, stage, panelists just stops and intermingles as it does at any good conference event. We ended up discussing WoW, Female/Male potential prejudices and sandwiches. There were a few eightbars (both current and former IBMers) who came along too so it was good to see everyone again. Thanks all for the discussion and look out for the video when its posted to hear everyones point of view. Hi ePredator, very insightfull reflections on the event. Did you address the pressing question of whether you have lots of identical ePred outfits, or whether you just have to do laundry every night?